Each day from October 22nd-31st, we will each have a blog post centered around Halloween. Be sure to check out each person’s post. Now that I have all the information set let’s get into my post!! 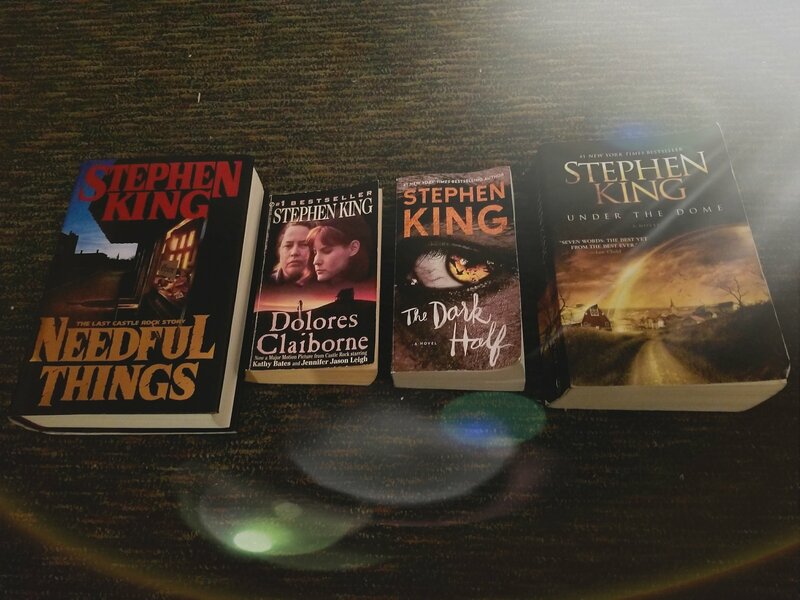 I recently (beginning of the summer) realized I have a huge love for Stephen King, after reading Under the Dome which I purchased at a local used book store. Here’s my collection so far! These are the books that I have already read and am keeping at my mom’s for the time being. These include Under the Dome, Needful Things, Dolores Claiborne, and The Dark Half. All of these I bought from my local used book store. These are some I found at my local used book store (Insomnia, The Girl who loved Tom Gordon, Bag of Bones, and 11/22/63) and one a friend of my boyfriend’s gave to me (Carrie) that have all different covers. 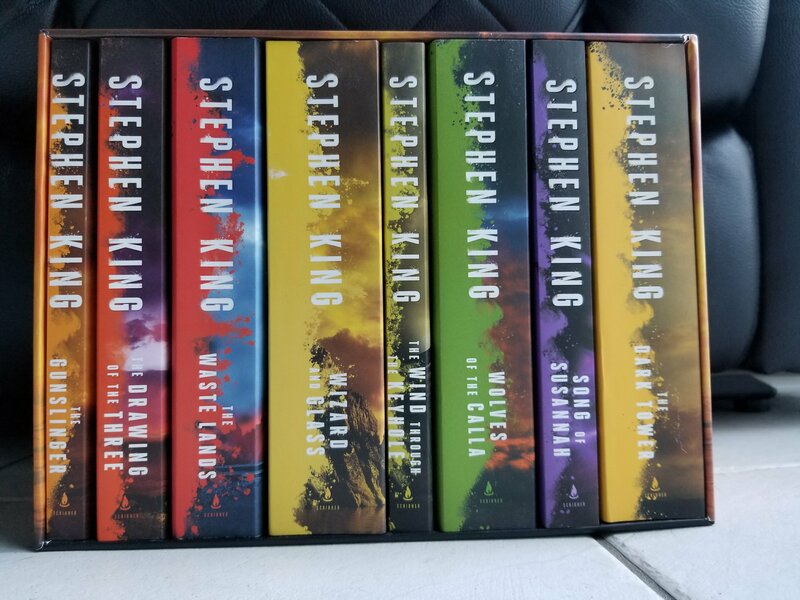 Here are my hardcover Stephen King books. I bought three at Barnes & Noble (Revival, Finders Keepers, and The Bazaar of Bad Dreams) and one at my local used book store (Rose Madder). Here are some that I found at my local used book store that had the same covers! These include Misery, Gerald’s Game, and Different Seasons. 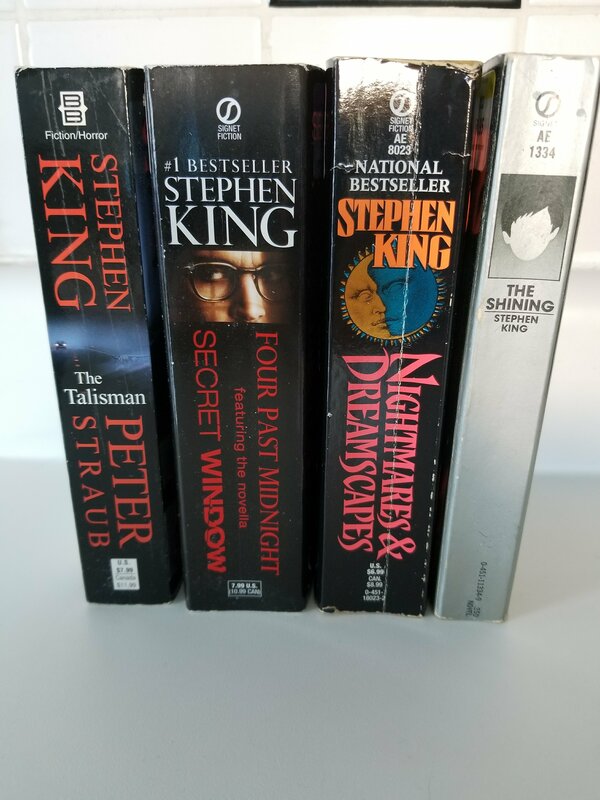 Here are some collections of short stories (Four Past Midnight and Nightmares & Dreamscapes), a book written with Peter Straub (The Talisman), and one with the oldest cover I’ve ever seen (The Shining) that I was lucky enough to find at my local used book store. Last but not least, the stars of my whole collection, The Dark Tower Series. My boyfriend was kind enough to surprise me with this gorgeous boxed set for my birthday! I’m currently on Book Three, The Wastelands and I’m absolutely loving this series. Great post! I’m pretty sure I wouldn’t like his writing. I’m not into horror. I’ve seen the Carrie and It movies though. Not my favorites at all, especially the creepy clown Pennywise lol. Yay for the blog hop! That’s a lot of Stephen King books! You’ve got a great collection! That boxed set is really nice! And you know that series all matches and stuff! You have a pretty great collection started. I’m thinking about doing a SK collection post at sometime too. (That is if you don’t care that I steal your idea!) I love your Dark Tower set! It’s gorgeous! My favorite book that I’ve read by SK so far is 11/22/63. You should definitely read it if you haven’t already and then watch the Hulu show! It’s great! Also perfect since the JFK files are finally being released to the public. Okay!! I’ll write one up! Soon..I hope! Wow what a collection!!! I’m not into horror but from what I know Stephen King is a favourite. Awwww stop it I’m blushing 😍😍 thank you so much! Omg! These are over 20 Stephen King books. I’ve read only one of his books a long time ago. I started Mr Mercedes about three weeks ago but I DNF’d it. It was more of a crime novel than horror. 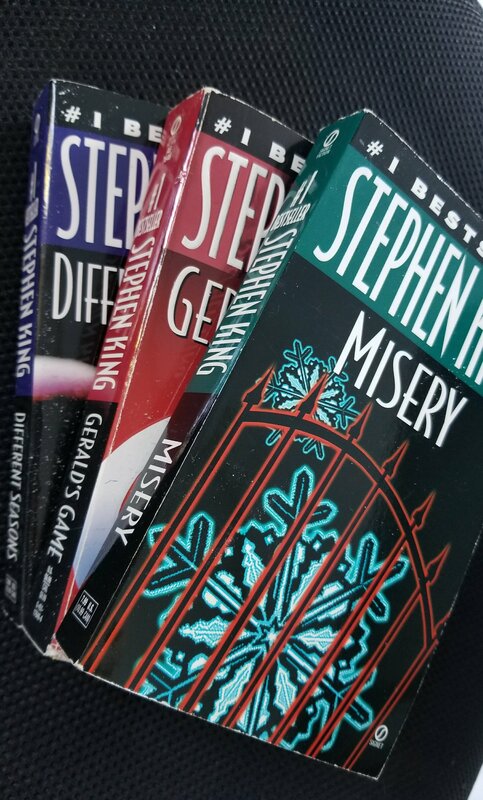 I do hope you’ll do a post later about the best say, 3 or 5 Stephen King books so I’ll know where to start. P.S. Your pictures are beautiful!! The Dark Tower Series are sooooo pretty!! Even I want them haha!! I love your photos!! You did so good!! I’m trash at taking book photos! Great post!! I loved it! Holy cow cow, this is such an amazing (and big) collection! I love collecting different editions of books! I have a Ray Bradbury collection going. I really like that set of The Dark Tower; I’ve found that series pretty intriguing and I hope to read it sometime! I love your King collection! Mine is quite small, but I’m trying make it bigger! I’ve read a lot of these books, I just don’t own them sadly! I was going to buy that boxset, but after doing some math it was cheaper for me to buy a different set individually than this one. I feel like the only difference between the two is the size of them, mine are smaller those ones are a bit longer. I believe the covers are the same. Do your covers all connect to make an image? That was something I thought was awesome about the set! I’m loving your collection. I really like His books too. Aww thank you! Which is your favorite? Such a great post! 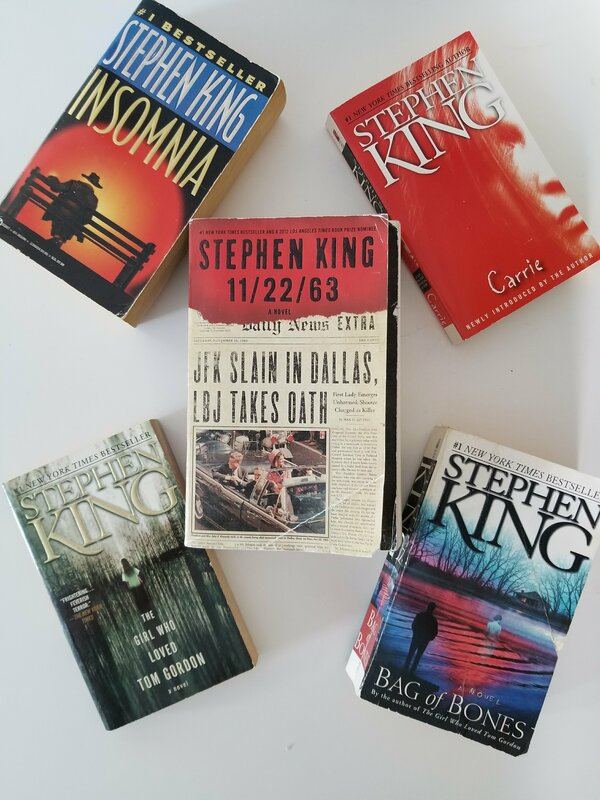 My husband absolutely loves Stephen King books! Thank you 😍 your husband has great taste! Such a great collection. I hope you get all of his books at one point! I always come across Stephen King books but have sadly never sat down to read one. The only thing from Stephen King I know is It (I know it’s a shame ). But you’re so educated in him! I want to read It and now I have more to add to his collection! I haven’t read any King books before, but I think I shall! Just in time for Halloween! 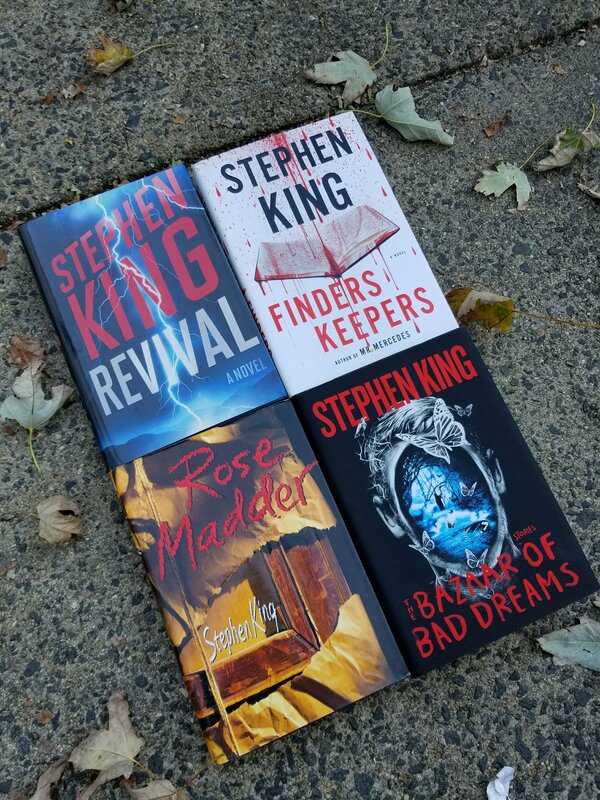 I’ve always been a bit too scared to read Stephen King – I’m worried they’ll REALLY freak me out, however your write up make these all sound so good I’ll have to add some SK to my TBR! I’m off to look up some of his books and find one to suit me! I LOVE Stephen King – ALL the Stephen King! I can’t wait to get started on my Stephen King books! Great stop on the Haunted Halloween Hop! Awww yes it’s worth It! I haven’t read any Stephen King book but his books are definitely books I want to read at some point in my life. I especially want to read ‘Carrie’ and ‘It’!